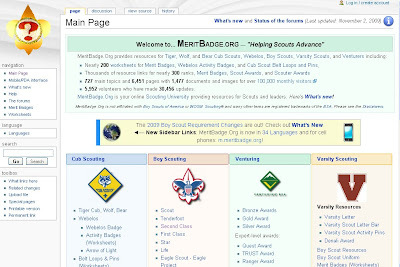 The digital rhetoric of the Boy Scouts of America merit badge webpage has moved away from the traditional books and booklets conventionally associated with advancement in scouting and has now embraced the wiki form. MeritBadge.org has many of the aspects of a standard wiki, where encyclopedic institutional authority and NPOV policies sometimes run afoul of the very structure of open access and user-generated content, whether it is a legitimate contributor lamely promising to deliver a better vector graphics image just as soon as he (or she) figures out the software or a spammer introducing "game power leveling and game gold" into the page for "helping scouts advance." When I was kid, I asked my dad why he wouldn't help me with cub scouting. He told me he wouldn't because they were a fascist organization. Imagine telling that to an eight year old. I was like... what's a fascist? Anyway, do you suppose he might be more approving if he saw this web page? Do I Have a Dog in This Fight?